This is the reason that motivated Talal Al-Tinawi, a Syrian refugee that arrived in Brazil with his wife and two kids at the end of 2013. “I chose Brazil because it was the only place that opened doors to Syrians without any identification documents”, he said. Indeed, it does not. According to Brazilian law, any refugee has the right to enter and stay in Brazilian territory, with or without documents, until his or her request for refuge is processed, and only risks being deported if the request is denied. Additionally, most of the requests are accepted – maybe because of the small numbers, maybe because of Brazilian history of acceptance and receptivity. Either way, Brazil has already granted refugee status to over 8,000 people from Syria, Congo, Colombia and many others, around 12,000 requests are estimated to be currently in process, and over 50,000 Haitians have been granted humanitarian visas. The numbers are small, if compared to European and Middle Eastern countries, but the undeniable reality is that Brazil hardly ever closes doors. Brazilian President Dilma Rousseff said it herself, at the United Nations 70th General Assembly: “Brazil is a hosting country”. And the statement is true – to a certain extent. Because as much as the Brazilian government does open its doors, that is pretty much all that it does. After entering the country, refugees are left adrift: there is very little orientation, virtually no services provided and government institutions’ staff are poorly informed on refugee laws and how to implement them. Even the one service that is fully provided by the government – documentation and the refugee status recognition – has been falling short. As mentioned, there are over 12,000 applicants waiting for a decision from CONARE (National Council of Refugees) regarding their status – the wait can take up to two years, and the lines keep growing. This happens because the number of refugees increased 1.240% in Brazil from 2010 to 2014, but no effort was made to match the number of employees in CONARE with the new demands. The government has announced that it plans on hiring more employees, partnering up with institutions and expanding the National Council’s activities from Brasilia to cities such as Sao Paulo and Rio de Janeiro, but so far no concrete action has been taken. Even if it does so, however, there are other alarming issues. Housing might be one of the most critical: while thousands of migrants keep coming in every year, the federal and local governments provide virtually no shelter for them. The Sao Paulo State government, to cite one example, has only one facility that can accommodate the minor number of 50 refugees, even though Sao Paulo is the state receiving the largest number of refugees. It was hence left for the third sector to take up the challenge. The United Nations High Commissioner for Refugees has been acting in Rio de Janeiro, Brasilia and Sao Paulo, and creating partnerships with the many non-governmental organizations that are now covering for government action deficiencies. Missao Paz, for instance, provides shelter for more than 100 migrants, donates clothes and food, and offers psychological counselling. Adus, an Institute for Refugee Reintegration, provides Portuguese lessons, locates job vacancies and follows up with the refugees in their first months of adaptation, among many other activities. “These people need support, not pity. Adus works to offer opportunities; an initial ‘push’ so that they can have autonomy, independence,” said Marcelo Haydu, the NGO’s director. Moreover, the Brazilian population has also been playing a significant part, once it became aware of the problem. After the recent news and Aylan’s photo – the unfortunate incident of the Syrian boy who drowned trying to reach Greece –, according to Haydu, many have gone to the NGO to offer help, donations or assistance – some even offered to host refugee families and adopt kids! The population’s and the NGO’s actions, therefore, have been the silver lining of the hectic situation. For many, it has been the only hope. “In the beginning it was very hard. The government helps us with nothing, only documents.”, Talal said, “But Brazilians received me very well, and now everything got better”. 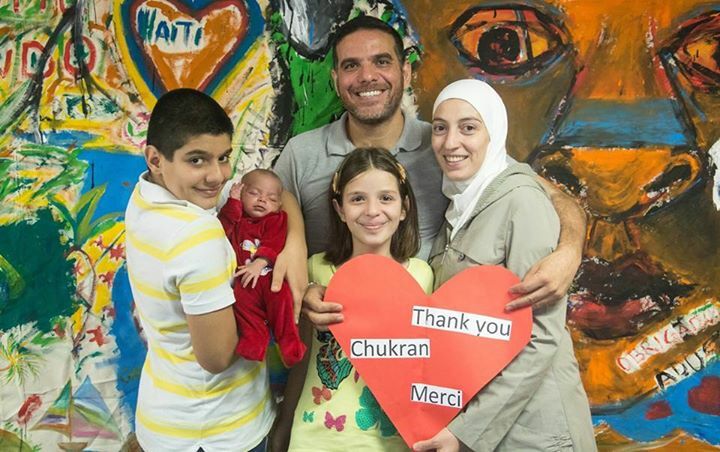 Talal is now opening a Syrian restaurant with money from crowdfunding, both his kids already speak fluent Portuguese, and he has a seven-month old daughter who was born in Brazil. When asked if he plans to stay in Brazil, Talal says he does. He and his family already started their lives from scratch too many times. It becomes clear that Brazilian civil society is, in fact, the reason to be proud of. One can only hope that, in the future, the government catches up with its society’s actions and implement a real policy towards immigrants and refugees. Then, and only then, will we be able to call Brazil a true hosting country. UNHCR Global Trends 2014. (2015, June 18). Retrieved October 24, 2015. Kingsley, P., & Traynor, I. (2015, September 15). Crowds build at border with Serbia as Hungary cracks down on refugees. Retrieved October 24, 2015. Brazil and UNHCR strengthen partnership to help refugees fleeing the Syria conflict. (2015, October 7). Retrieved October 24, 2015. Benedetti, A. (2015, March 3). Haitians Have A Hard Time Finding Work In Brazil. Retrieved October 24, 2015. Brasil tem boa vontade, mas estrutura é precária para receber refugiados. (2015, September 12). Retrieved October 24, 2015. Governo de São Paulo acolhe refugiados em casa de passagem | Notícias | Portal do Governo do Estado de São Paulo. (2015, September 11). Retrieved October 24, 2015.